We complete all types of residential concrete projects. These include house slabs, paving, steps and all forms of decorative concrete. Most common residential homes typically require driveways or house slabs. 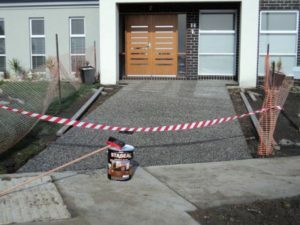 A typical driveway and paths around houses will generally need some type of excavation and sub-base preparation such as crush rock which has been laid and compacted. Good concrete preparation is imperative to a good finish on top. This also ensures it lasts long. Unless you have a special project going on chances are relatively high that standard 25MPA ready mix concrete will be perfect for your specific needs, but sometimes people like to up the MPA to get a stronger strength concrete. Plain Concrete- Plain concrete is the cheapest and the easiest to finish as it requires the least amount of work. Other concrete suppliers have many types of colors which will require a special order. Once you have selected your mix, next is for design. Now the design of your project will determine if its a rip up a job or a new house etc. Its always advised you have a look at other houses and magazines to generate ideas and get a real life example of what the actual concrete looks like. Pricing will be determined by the size of the job, work required, pump access, steel requirements and a number of other factors. We strive ourselves on quality so please keep this in mind.